The Guardia Miranda and Botiguero vineyards that the fruit for this wine comes from are in the Secastilla Valley, in the north-eastern part of the north-eastern Spanish wine region of Somontano. They have a Mediterranean microclimate, are planted with old vine Garnacha more than 2,2000 feet above sealevel, and see lots of sunlight. Vinas del Vero, the winery who produced the wine, was founded in 1986 and is considered one of Somontano's best producers. 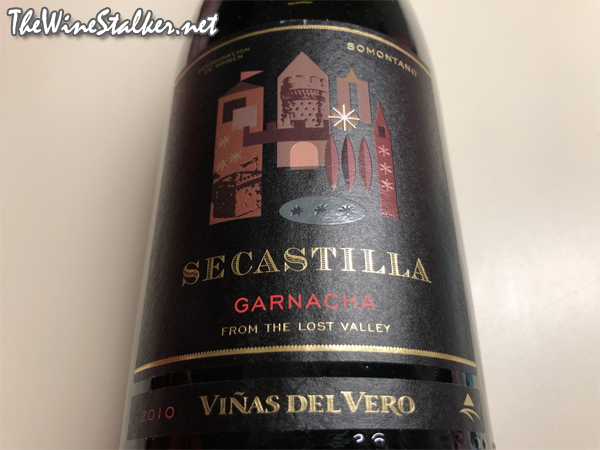 Their Secastilla Garnacha 2010 is 100% Garnacha from "very old vines", and the fruit has to go through two selections after harvest to make the cut. The must is macerated for fifteen days below 77°, emptied into vats for fermentation, and then put into French oak barrels for malolactic fermentation. It remains in the oak for ten months of aging. The ABV is 14%.